How does a destination’s sustainability performance influence its competitiveness? And its reputation? Having presented answers of our tourism sustainability panel to the first question (competitiveness) in our previous post, today we share with you a selection of panel answers referring to destination reputation. Sustainability measures, especially when leading to happier residents, will generate positive impressions among visitors and thus impact destination reputation. To avoid reputation “surprises”, destinations should measure the sentiments of their residents, in addition to soliciting feedback from visitors. A destination’s favorable sustainability image benefits its tourism products and service providers (“halo” effect). Managing performance requires undertaking a significant number of activities. While some destinations are addressing elements of sustainable tourism, few are doing the complete set of activities in a systematic manner. Many of the most important activities are “invisible” to visitors. And few destinations are good at communicating their activities in ways that resonate with consumers. Sustainability activities often “head off” problems before they happen. Problems averted may not be obvious to consumers. For instance, one principle of sustainable tourism is measuring resident sentiment about tourism – and then acting on the feedback. Few destinations are regularly and systematically monitoring and managing these factors – and so it is a “surprise” when issues of resident dissatisfaction bubble up and cries of “overtourism” become an issue. Measuring resident sentiment is not an activity that visitors would be aware of if they visited the destination – it is invisible to them, but it is an important task. Destinations that do monitor and act accordingly are less likely to have problems. I think the question would need to be “what reputation would a destination that is applying sustainable tourism principles have?” My expectation is that visitors would consider that the destination provided great experiences that enriched visitors culturally, and environmentally; that businesses seemed to be thriving and contributing to the local economy, that local workers were happy and that the locals were genuinely welcoming. Reputation wise, I believe that word of mouth is one of the most effective tools in the box spreading the realities of a destination. When a destination is caring for its environment, and associated people, travelers are more engaged, happy, and likely to recommend the location to friends and family—likely to post positive images and stories in social media, and remarks on reviews, etc. Several studies have shown that destinations that strive to achieve sustainable tourism development are regarded more favorable by potential visitors. Sustainable destinations are also more likely to be noticed on the broader tourism market, since they offer unique elements that other destinations do not have. Based on this we can also conclude that positive reputation is associated with destinations that involve high efforts in sustainable tourism development. A good example from Slovenia is Ljubljana, whose focus on sustainable development as part of the Green Scheme of Slovenian Tourism and as European Green Capital has positively impacted its reputation. This positive image now also benefits individual tourism providers and tourism products in the city. A destination’s sustainability performance influences its reputation because visitors and stakeholders can identify the good practices and share those through word of mouth with other stakeholders. It can influence also the quality of the touristic experience in general, which in turn can support the marketing strategies. Get to know our destination sustainability panel here. In collaboration with the Sustainability Leaders Project. 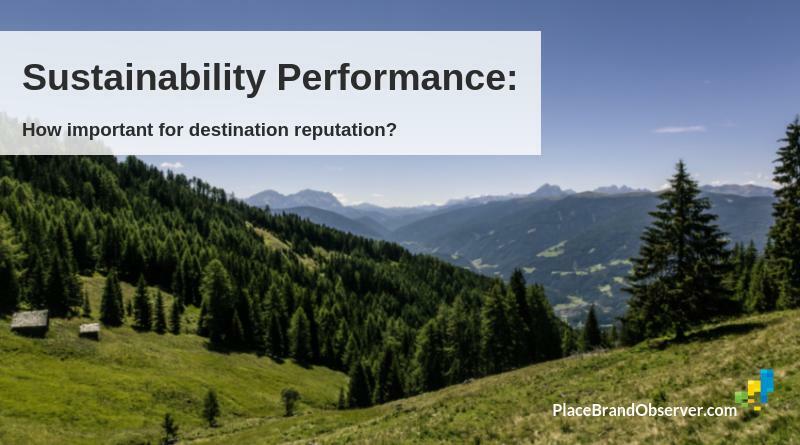 Enjoyed this collection of expert views on the links between the sustainability performance of a destination and its reputation? Spread the word! ← Destination Sustainability Performance: How Important For Competitiveness?